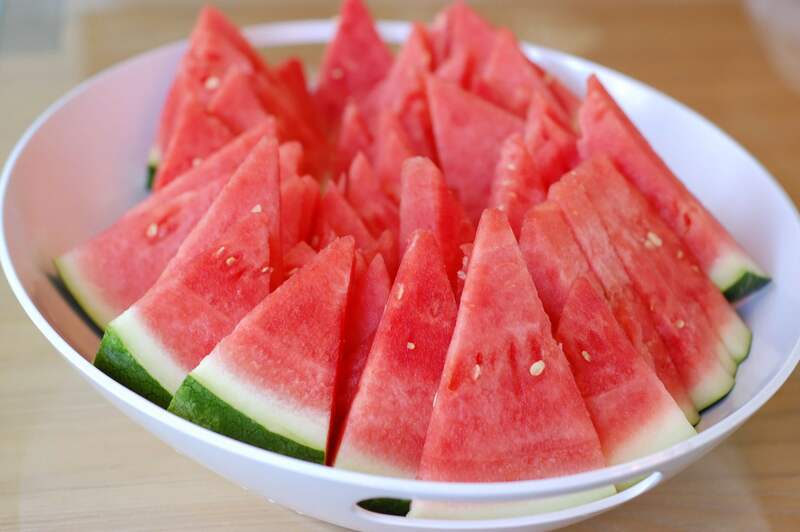 There’s no reason a “real food” diet should stop anyone from havi ng a fabulous backyard BBQ, cookout, camping trip, or picnic this summer. Sure, preparing lots of “real food” from scratch can be more work than the store-bought junk, but the satisfaction of knowing you just fed the neighborhood kids an approved “100 Days of Real Food” meal unbeknownst to them is very much worth it. We hosted an annual street-wide event in our backyard over the weekend, and I loved watching my girls have tons of fun with their little friends while at the same time knowing we didn’t have to succumb to the usual party junk food (store-bought pizza and cake) to have such a good time. Cheeseburger sliders – These junior-sized patties were assembled in advance using locally raised ground beef and were the perfect size for kids! Honey whole-wheat buns – Great Harvest makes dinner rolls with their 5-ingredient 100% whole-wheat bread recipe that we love, and they happen to be the ideal size for sliders. Potato chips – Deep-fried foods are not part of our “real food” diet so we love that Kettle Brand offers REAL baked potato chips made with only three ingredients. Their version is light-years ahead of the potato flour concoction that Lay’s tries to pull off as baked chips. 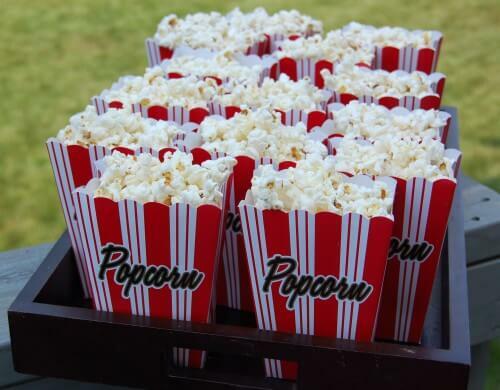 Popcorn – I’ve said it a thousand times…thank you popcorn for being whole-grain! And when you serve it in fun little bags (that I found at Party City) the kids don’t even notice the popcorn they’re chowing down on isn’t caked in the usual refined oils and salt. Apple Juice – After checking four different stores I was not satisfied with the juice box options that were available. When serving my children apples, applesauce or apple juice I prefer for it to be organic since apples are on the dirty dozen list. The only organic juice boxes I could find had added sugar, which is totally not necessary! So I just put a jug of 1-ingredient unfiltered organic apple juice with some ice in a big glass beverage dispenser. As it turned out the kids loved writing their names on cups wit h “permanent markers” and filling it up themselves. 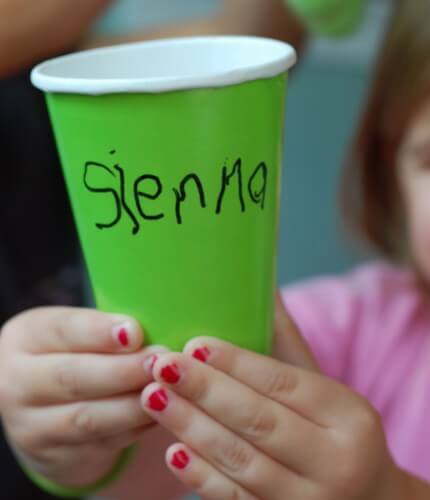 The first thing my 4-year-old did the minute the party started was run over to the juice so she could write her name on a cup (pictured) and fill it up! Snow Cones – These shaved ice treats can easily be turned into a whole food dessert if you omit the sugary processed syrups that are usually squirted on top. For our “syrup” I like to slightly dilute organic frozen juice concentrate (like orange, apple, and grape) and put it in our own squeeze bottle instead! It works perfectly. 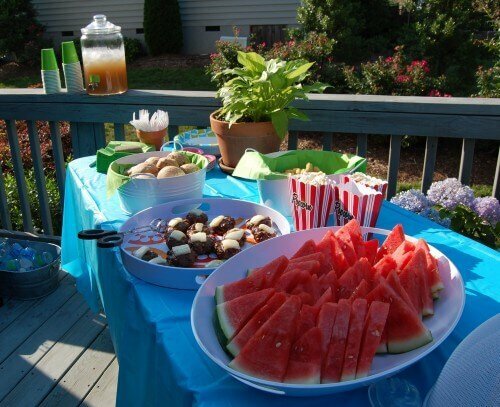 Lastly, if you’ll be celebrating a birthday at your summer party check out these candy-free party favor ideas as well. In other news, we’re thrilled that our story was recognized by one of Rachael Ray’s bloggers. Please follow the link and click “like” if you like this too! As always, thanks for your support! “Real Food” Condiments: Do They Exist? I’m cracking up! My daughter went to 2 events this past weekend. The menu? Pizza and sweets! I know the kids would have had so much more fun with this menu! Thank you for the great ideas! Fabulous! This is perfect timing as I am preparing for my daughters 2nd birthday next month – I’m sure I can put a smashing spread together with these ideas! Thanks Lisa! Could you not have potato chips fried in locally raised beef tallow? If you are thinking that would be something to make from scratch it sounds like a great idea for just our family one evening, but I was already jam packed just putting together what we had! In addition to the food I had a bunch of activities planned for the kids as well so I was happy to take shortcuts wherever I could! You have a 4-year-old named Sienna too??? I live in Union County (NC) and LOVE your blog. Looks like we have more in common than just a passion for healthy, clean food! I’ve been bringing home made cole slaw and potato salad to all our block parties recently since my CSA is leaving me with more potatoes and cabbage than we can eat. It’s healthy, seasonal, local and almost free! We live on fesh pasta salads in the summer. I make my own dressings and we mix up the ingredients. Rotini with sauteed chicken, homemade ranch, fresh Matthews farmers market tomatoes, blanched broccoli, green onions with shredded sharp chedar is fab…I started experimenting with dressings a few years ago and rarely purchas them anymore! Would love to see some of your dressing recipes if you don’t mind sharing! YES! Please share your homemade ranch dressing recipe! I’ve been stressing about that this week after looking at the ingredients in Hidden Valley Ranch that help the veggies go down for my girls! I’ve been trying various homemade ranch dressings this summer. So far I really like Carrie Vitt’s recipe over at Deliciously Organic the best. Lisa, I hope you don’t mind me mentioning Carrie’s site. I didn’t think you would mind since I first learned of her site from you. Both of you have wonderful recipes that have helped me rid the artificial junk from my family’s diet! Out of curiosity…are there any tortilla chips that you would recommend? I know corn is one of the worst as far as GMO’s are concerned. Aside from that, Tostitos boast that they are all natural with no preservatives. There is, I think, only 3 ingredients in their tortilla chips. Yes, tortilla chips are only 3 ingredients, but most of them are deep fried in refined oil so unfortunately I don’t know of any “approved” ones off the top of my head. You can make these so easily by just taking tortillas, brushing with a little olive oil, cutting into wedges and baking or broiling on a cookie sheet in the oven for a few minutes. Easy, delish and inexpensive. Must better than store bought. If you happen to live near a Trader Joe’s, they have organic tortilla chips that are great! (and cheaper than you’ll find other places too). Thanks for the tips! Love the Target idea! oops I meant to write this on the lunch idea page! I just answered your question on another post, but wanted to leave it here too. We eat the waste we just don’t serve it to guests. I looked at the potato chips you mentioned and they contain citric acid, which I recently read online was a hidden form of MSG. Have you heard of this? Also wondering about the oil used. I had read online that neither of those are good “real food” oils. Thoughts? Yes, those chips are more of a treat in our family, but we feel it’s a better choice (albeit not a perfect choice) when compared to some of the deep-fried options. I hope that helps! soooo glad i found you! i’m totally interested in eating as clean as possible. i’m currently training for a body buildind competition, but i will definitely be staying on track with my diet after it’s over. i’m a follower of yours for sure! Oh I wish I would have seen this post before today. I just ran to the store and grabbed processed junk for my daughters birthday party tomorrow. Time got away from me and I was just looking for quick and easy (which all of your options are). I am so used to just grabbing chips and juice boxes, eating real food is something I am still learning. It’s not second nature for me. I am very passionate about eating “real food” and have always tried to do that as much as possible with my kids; however, as the years have passed I have gotten lazy about it. Reading your blog has totally inspired me to “start over”!!! We love fresh guacamole and salsa….now what do we eat it with??? We will also be having a salad with black beans, edemame, corn, and sweet red pepper at our 4th of July celebration. Trying to ease the extended family into healthier eating one delicious dish at a time. Thanks for great ideas! I was getting overwhelmed trying to plan a cookout that somehow balances what i now eat (real food & GF) and what extended family and most friends eat (junk & processed!). I see it can be done. This is full of great ideas. I did not realize the Kettle chips vs Lays “situation.” As a (rare) treat my son always asks for the Lays potato chips which I will sometimes allow. I will have to steer him towards the Kettle chips from now on, since they always seem to be in the aisle as well. Have a great holiday! Great tips! The only thing I would do differently is freeze some of the apple juice in ice cube trays and use in place of ice. Cold juice and not watered down at all! Thank you for all the great ideas. I love to serve deviled eggs when I have cookout.